Merriam-Webster Dictionary defines “foodie” as, “a person who enjoys and cares about food very much.” With such a broad definition it’s no wonder that many throughout the Midwest fall into the foodie category. In fact, we care about our food so much that we plan much of our leisure activities around food, including participating in the Cheese Curd Festival and all the fun food events and activities found there! The Cheese Curd Festival’s Presents Sponsor, Ellsworth Cooperative Creamery, is seeing this growing trend play out in their retail stores in Ellsworth and Comstock, WI. Over 250 kinds of Wisconsin-made cheeses take center stage there, including their own varieties. Combine that with their extensive selection of regionally crafted beers and wine and you’ve got what some would call foodie heaven. It was their fresh squeaky white cheese curds that first put Ellsworth Cooperative Creamery on the map and earned Ellsworth the designation of Cheese Curd Capital of Wisconsin. 170,000 pounds of cheese curds are made at the Ellsworth facility daily, and cheese curd fans from near and far begin to line up just before 11:00am to purchase the first of the fresh curds produced that day. You can thank their Comstock, Wisconsin, facility for producing over 80 different varieties of artisan and specialty cheeses, which are also available for purchase at their store. In fact, visitors will find one of the largest selections of Wisconsin-made cheeses in the region under their roof. Their newest cheese creations are often tested and rolled out to their retail stores’ customers before being made available to gourmet cheese shops and grocers. That’s how cheese lovers can get their hands on new and trending flavor combinations like Pizza Cheese Curds, Sour Cream and Onion Cheese Curds, Buffalo Wing Jack Cheese and Habanero Ghost Pepper Jack Cheese. They offer samples, spotlighting best-sellers, their award winners and seasonal favorites. We recommend stepping outside our comfort zone and tasting something new. You might find a new favorite! And since man can’t live on cheese alone, they offer a well-stocked wine and beer department including regional labels such as New Glarus and Wollersheim, Door Peninsula Winery, Three Lakes Winery, and more. Of course the real beauty of wine and cheese is enjoying them together. They recommend picking up a free cheese and wine pairing guide when you visit. Customers will find many suggestions for pairings and a variety of cheeses available for sampling each day. Shoppers can experience cheeses they may have never tried before and easily pair their selections with wines that complement their purchases. While you’re there check out the locally made bratwursts and hamburger patties with Ellsworth’s natural cheddar cheese curds among the ingredients. Shoppers also enjoy exploring a wide selection of souvenirs, gift items, and unique kitchenware and home accessories. Don’t forget to treat yourself to some premium soft-serve ice-cream and some of their house-made Flo’s Fudge–after all that browsing, you deserve it! The Ellsworth Cooperative Creamery’s retail store, which is open 9am-6pm daily, is located in Ellsworth, at 232 N. Wallace, just two blocks east of the Cheese Curd Festival grounds. Free tractor shuttles will be transporting festival guests between East End Park and their retail store; hop on near Associated Bank adjacent to the park. Barring anything unforeseen, the fresh curds of the day will be available at the store promptly at 11:00 am. New this year, it’s a Cheese Curd Pop-up! 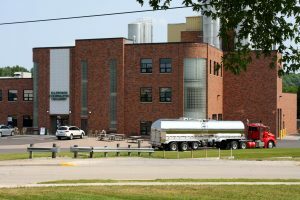 You’ll find the Cheese Curd Wagon in front of Ellsworth Cooperative Creamery–actually, you’ll probably smell it before you see it because wafting out of the trailer is the delicious smell of cheese curds frying! They’ll be serving up deep-fried cheese curds to visitors this summer, Thursday through Sunday, from 10:30am – 5:00pm (except for during Cheese Curd Festival when deep-fried curds are available at East End Park). Make a point to pay them a visit this summer! Grab a free cheese and wine pairing guide when you visit their retail store to find the best pairing for any new cheeses you discover. The Cheese Curd Capital of Wisconsin mural is a must-do photo opportunity for serious cheese curd fans. Your friends will be envious when you post it to Snapchat, Instagram, Facebook or Twitter. If you can’t make it to the Cheese Curd Festival, or their retail store, you’ll be glad to know their products can also be purchased through their website here. They ship all over the country! The Ellsworth Cooperative Creamery has an active and growing community on Facebook where proud Cheeseheads stay up to date about new products, promotions, events and recipe ideas. You’ll want to follow their page here.